I love battlement couching! If you’re not familiar with what it is, you’ll find a tutorial for it right here on Needle ‘n Thread. 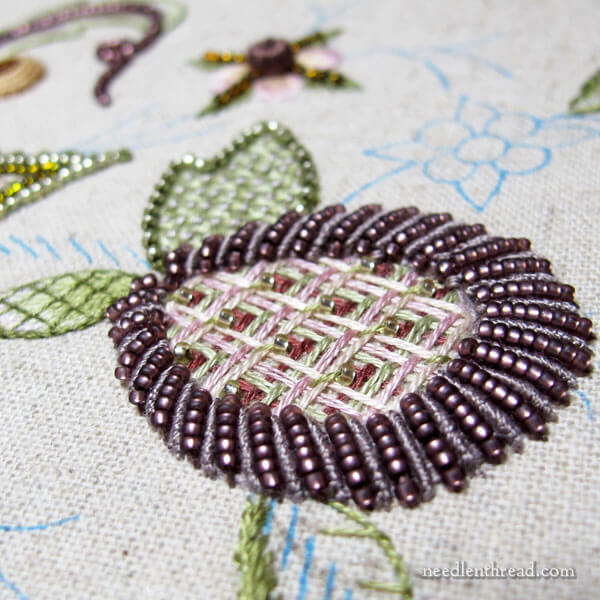 While I’d used battlement couching in crewel work with wool threads, it wasn’t until I made use of it in my Lattice Jumble Sampler that I really fell in love with it. It really is a magnificent filling technique for surface embroidery of all types. Well, needless to say, I was pretty happy that Hazel makes use of battlement couching in Late Harvest. It fills the center of the pomegranate in the middle of the piece, and it shows up on a couple other elements out on the sides of the design. I’ll show you one of those elements today, and tell you the good (and the bad!) about my work on it. This is the filled center of this element. It’s ok, as far as battlement couching goes, but I regret the layout. The whole layout of the filling should be a shifted a bit downwards to the left in that photo, so that the first lower bead line is farther forward on the flower. It may not look like a big deal at this point, but it makes the finished element look a bit square. I had a gut feeling I should have re-done it at this point and shifted the layout, but I also had this little internal naggy voice telling me that it would look ok when all was said and done. And that’s one of the nice things about this project! There’s so much going on in it, that everything does balance out. So I decided just to hold out and see the element through, as is. I’ve gotten rather lazy about picking things out and re-doing them lately (and I’m not sure if this is a good thing or a bad thing). 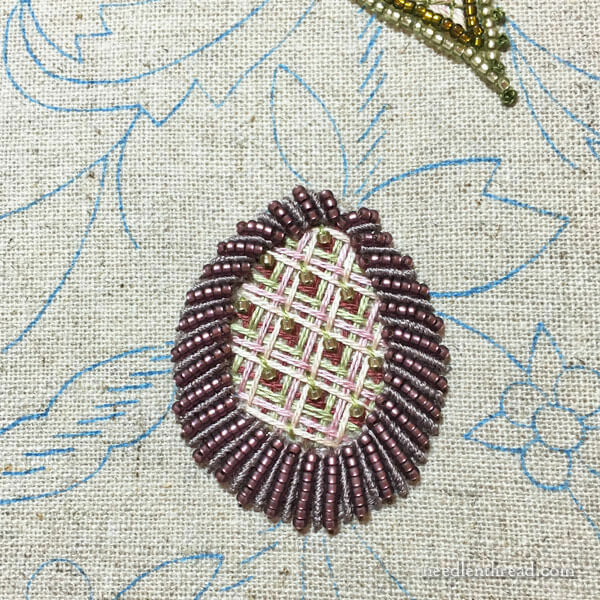 The heavy outer edge of this element consists of stem stitch padding, over which is worked alternating lines of beads and bullion knots. Eventually, a good bit of the tip of the element (by the leaves in the photo above) will be covered with stumpwork leaves. So while the design looks a little bare around the element right now, it’ll all fill in when the stumpwork leaves are added. So there’s the finished element, and you can see how that straight line at the lower left makes it look a little bit square on the inside. I think if the beaded line in the filling were further forward, the filled center wouldn’t look so squared off there. Will it matter in the finished piece? Probably not. Like I said, there’s a lot going on in this piece, so this particular glitch (that I notice, but other people probably won’t) will just blend in. So, I moved on, adding the leaves around the element. The busier it gets around this part of the design, the less I notice the squared look on the forward edge of filling, unless I’m really looking hard at it. On the other hand, I still see it. I’ll give it time, keep filling in around it, and see what it looks like down the road. Worst case scenario: I might have to pick out the center filling and re-work it. I like the way the purple beads on the element we’re talking about here are also part of the leaves around the grape bunch close by. It ties the two elements together across the design. So that’s where I am on Late Harvest! Just plugging along and enjoying the heck out of it! Oh Mary it looks lovely, you really are coming along nicely with the Late Harvest project. I can’t see anything wrong with your battlement couching and with the other elements of the embroidery I’m sure it won’t notice. I love working with beads and the beads in this project really enhance the piece. Thanks for the information on Hedgehog Handworks sale thats good to know. Thanks for showing us your progress on the Late Harvest and for the good news from Hedgehog’s. How much more is there to do? Will you be framing it? Oh, that project is coming along nicely, Mary! Can’t wait to see the finished piece. 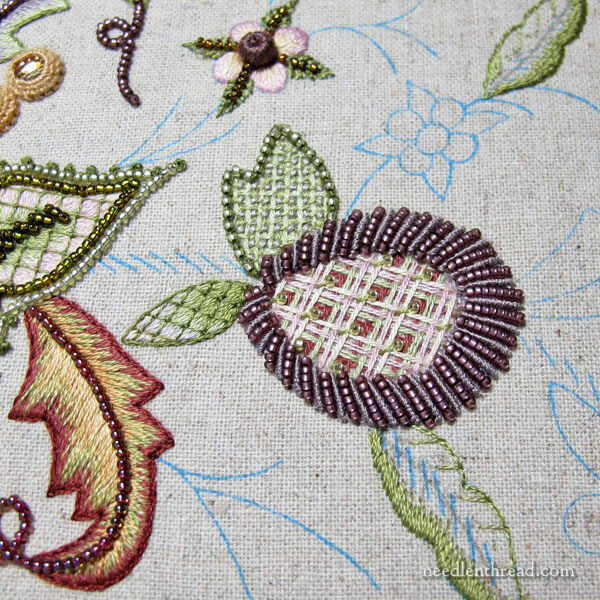 So much gorgeous needlework and beadwork — no wonder you are having so much fun doing it. Mary, your stitching is such an inspiration! I think it’s absolutely gorgeous and, if you don’t mind my saying so, you’re a little bit nit-picky! I checked out the kit, and I can’t believe the size I saw – just 14 1/2 by 4 1/2 “?? and you do it so well…thanks for sharing all your knowledge. Hi Mary, I have Hazel’s book and feel I’m ready to try some of her simpler pieces. Biggest roadblock for me is that I’m not sure what to use for a ground material. I know she refers to hopsacking. What are you using on your current project? This is a linen blend – I think it’s a linen cotton blend. I don’t know the type or brand or anything. I think any closely woven linen would do the trick, like Strathaven natural (available at Hedgehog). You’d have to line it with cotton muslin, to give you a good base for close stitching, which is what Hazel does, too. 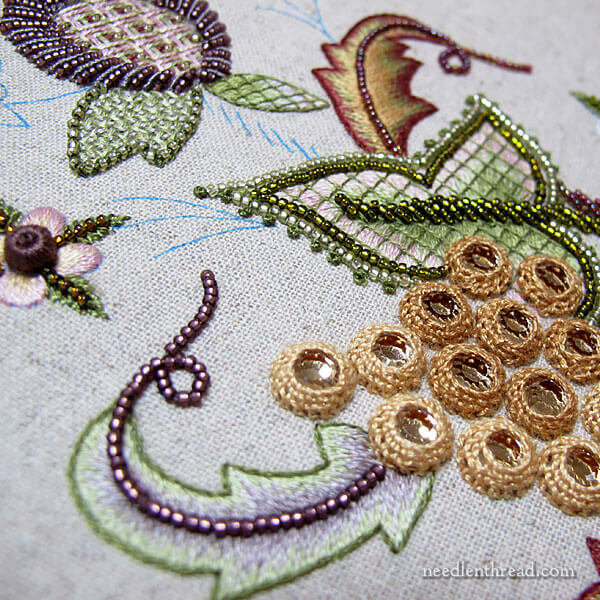 This piece is a marvellous tangle of stitches, beads and techniques. I’m sure it’s sufficiently busy for a few things that don’t look perfect to your critical eye will blend in happily once there’s enough distraction elsewhere. 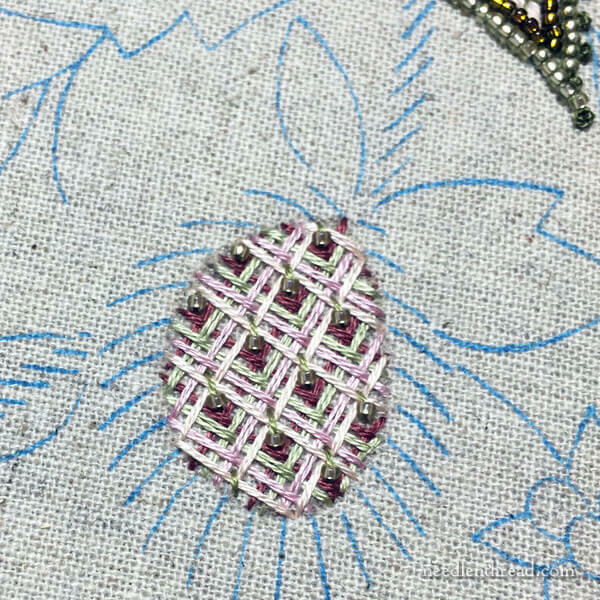 The last photo on this page shows up how well the shading on the grape-leaves works – with the central vein of beads on the small leaves almost ‘leaking purple’ and with the overlaid grid on the large one seeming to float over the stitches underneath. Sometimes we need an angled view to see just how effective things like this are. Square-on photos are great for showing method and placing, but don’t enhance the relationships between pieces nearly as much as a three-quarter shot. I think it looks beautiful after all those beads where added. I was tilting my head to look at but probably because of the angle the photo was taken at. I agree it would be a lovely pineapple! Have you heard of DMC’s new line of floss called Coloris? The variations in color change every 2 inches instead of 4-5 inches. I’m excited to try some. I wrote them and they said the USA should start seeing it in April. I’m also waiting to hear when the one and only shop in the US stocks up with Cottage Garden Threads. She said she would notify me. I’m not a fan of variegated floss but I think I would be won over if they changed colors more often. Maybe I just don’t know how to use variegated floss properly. Can’t wait to see the next element in your project. Lighten up – the piece looks fabulous! Thanks for the heads-up on the sale. Stunning results indeed when those bullions and beads bulge dimensionally around the battlement center. 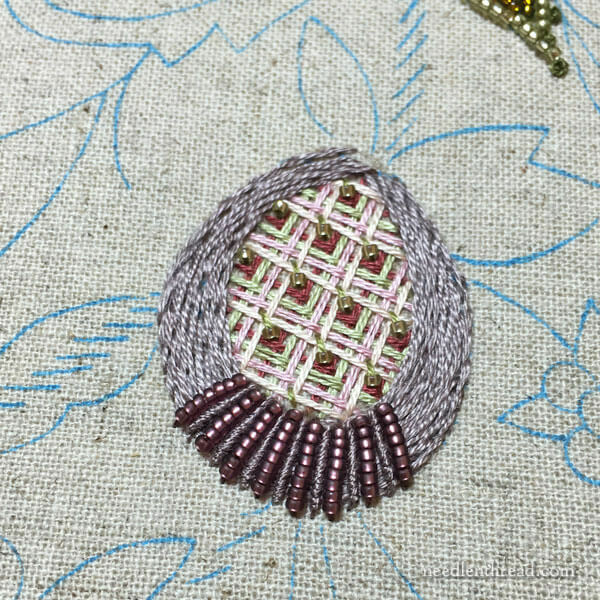 Would popping in 3 of the green beads just next to the pinkish long threads closest to the purple area achieve the harmony you think is missing. A squeeze but sensible? That you continue to inspire we distant readers cannot be emphasized enough! Mary, your piece is beautiful. I love the aďdition of beads.